Explore the breathtaking beauty of the rainforests of Kuranda and Daintree, and the charming coastal towns of Port Douglas and Cairns beaches on this five-day itinerary. Beginning and ending in Cairns, this itinerary has countless reasons to extend your trip if you like, to enjoy the nightlife of the city or the majesty of the Great Barrier Reef. This itinerary is a no-brainer, as your primary road is the Captain Cook Highway. The first leg of your trip is short, so if you get a late start you will have plenty of time to get settled once you arrive. Drive 28 km north and west (about half an hour) via the Captain Cook Highway to the 'Village in the Rainforest.' You can take a nature walk while still in the town. Wildlife abounds with parks for snakes, koalas, birds, bats and butterflies. Once a counter-culture centre, Kuranda now boasts a lively and unique collection of shops and a regular market with many arts and crafts stalls. 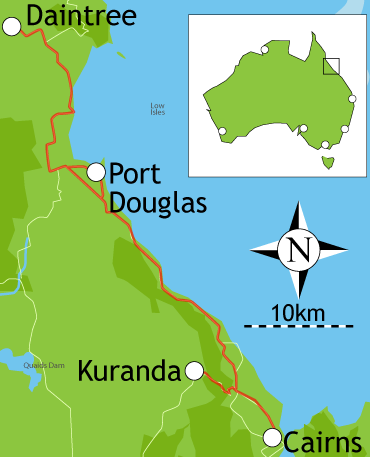 Drive 68 km north (just over an hour) on the Kennedy and Captain Cook Highways to the coastal town of Port Douglas. At once sophisticated and low-key, this stylish coast town is known for its famous visitors (including Bill and Hillary Clinton), clothing boutiques, and fine dining. It maintains its charm, with low-rise buildings and wide streets. Over 100 different tours depart from Port Douglas daily, so many people make it their base of operations. If you haven't seen enough of the Great Barrier Reef, book a tour here. Four Mile Beach is wonderful for summer swimming and year-round lazing. You can eat at the Surf Life-Saving Club and swim in the protected water there. At the opposite, southern end of the beach, you can try your hand at kitesurfing, especially during the winter. Day 3 takes you 55 km (about an hour) north and west via the Captain Cook Highway to Daintree, adjacent to the Daintree National Park. Within this largest piece of tropical rainforest in Australia, you will find the most diverse variety of flora and fauna on earth, and especially many rare and threatened species. Enjoy the vast golden beaches, but do not swim with the crocodiles or stingers. Mossman Gorge is great for swimming. Be sure to try the barramundi, a fish for which the region is famous. Located on 30 acres at Wonga Beach, close to Daintree National Park and Port Douglas, this resort features tropical gardens, beach frontage, two swimming pools, a children's playground, game room, kiosk, Internet access, laundry facilities, and an undercover camp kitchen. Accommodations include cabins (some with shared amenities), powered and unpowered campsites, ensuite cabins, powered and unpowered van sites, and self-contained villas. The longest leg of your trip takes you 83 km south and east (1 hour and 15 minutes) via the Captain Cook Highway to the northern end of Cairns Beaches, where you will find the oceanfront caravan sites at Ellis Beach. The Cairns Beaches, or Northern Beaches are a line of beach communities between Port Douglas and Cairns. From north to south, they comprise Ellis Beach, Palm Cove, Clifton Beach, Kewarra Beach, Trinity Beach, Trinity Park, Yorkeys Knob, Holloways Beach and Machans Beach. The stretch for 26 km and each is at the end of its own spur road off the Captain Cook Highway. Trinity Beach is a favorite with visitors from Cairns. It's relaxed and tropical. Palm Cove is more intimate and old-world. It boasts a world-renowned tropical zoo at Wild World. The beaches are just a few miles apart, so do some exploring to find the beach that suits your own style. The last leg of your trip takes you back to your starting point, 27 km south and east (about half an hour) via the Captain Cook Highway. Cairns, with its tropical climate and great beaches, is just an hour by boat from the Great Barrier Reef. You can go on your own, or take one of the many day trips on offer. Cairns offers great shopping and dining as well as art galleries and other cultural attractions. It is a backpacker's Mecca with lots of inexpensive rooms, a variety of adventure sports and plenty of clubs for nightlife.